According to Bloomberg, unsolicited mail now accounts for 86% of the world’s email traffic. Our premium spam filtering service eliminates the junk and keeps only what’s relevant in your inbox. Unlike other spam filtering systems that rely on “fancy” algorithms that spammers can defeat, our rule based system features over two million rules that were created by real humans! An entire team of real people are working night and day creating new rules to combat the constant stream of new tricks that spammers, thieves and hackers are deploying. A “false positive” is when a good email is blocked by a spam filter. While other rule base filters use automated systems to “auto-learn” spam, a process that is prone to errors, our rules are carefully engineered to ensure that only real spam is blocked. Rather than just deleting spam that is blocked, all spam is placed in an easy-to-use domain-wide quarantine where it can be viewed by you, further ensuring that no good email is ever lost. You can also set up a separate quarantine for each user on your domain. In fact, you don’t even have to tell the filter what email addresses on your domain are valid. During your first month, we’ll auto-learn what email addresses on your domain are valid. Or, you can configure valid email addresses and we’ll reject email sent to the rest. It’s easy to get started with our service and we’re compatible with virtually all email services even other hosting providers. If you host with us, we’ll take care of the setup. If not, we’ll guide you through the simple “MX” record change, a process that usually takes less than 5 minutes to get setup! Still not convinced? Try it out by starting your risk free trial today. You won’t be charged a penny if you cancel within the first 30 days. You will be billed $10 per month after the free trial period ends. Incoming, unfiltered email directed to your domain. Along with the good email you want, it includes a barrage of spam, phishing and virus emails that you don’t want. A simple change to your domain’s MX record puts our extremely powerful and remarkably accurate filtering service to work for you. 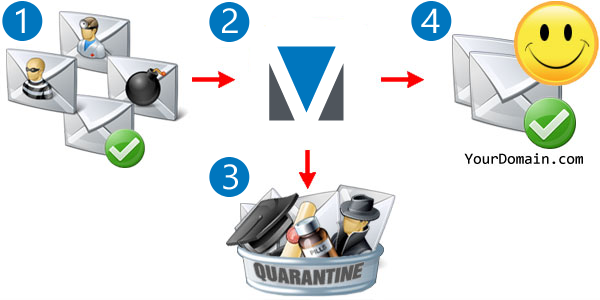 The bad stuff is put in a “quarantine viewer” so that there’s no chance of ever losing good email. In the unlikely event that a good message is blocked, it can be viewed in either the included shared quarantine or optional individual quarantine viewers. GOOD email is delivered to your domain without delay …BUT… the bad email is captured (quarantined). Our service outperforms the competition because our filter rules are crafted and managed by real people who have already created 25 million filter rules while adding over 12,000 more each day! We also track over 100+ million senders to help identify and block new spam campaigns in real-time. Filter mail for an unlimited number of users on each domain at no additional cost. Unlimited quarantine user logins are included too. Enjoy the simplicity of per-domain pricing with no extra fees. We filter up to 100,000 messages per domain each month. Each additional 100,000 messages is billed at $6.50.